Stewart Town is now just the dusty remains of a few mid-nineteenth century rammed earth and stone miner’s buildings up a hillside above the junction of the Kawarau and Clutha Rivers between Cromwell and Clyde (Otago, NZ). Where mountainsides weren’t sluiced away in search for gold, historic relics sketch out a hard-working past: The stone lined clay walls of a hugely impressive reservoir bigger than a football field, made by hand with stone and clay, up a punishingly remote mountainside; water races, stone lined and still partially intact, hewn into the slopes; and the gnarled old relics of an orchard. I imagine these sweet pears (Pyrus sp.) and apricots (Prunus armeniaca) punctuating the miners’ diet of dry stores and mutton like rare gifts from the stern kind of god favoured by hard Presbyterian Scots in Central Otago back in the day. For my visit, the apricots were just pips on the ground and the pears just a little while before their best. Not to worry, they were bound for the cooking pot in my plans and that way could at least be gathered ahead of the possums, wasps, grubs and whatever else was likely to mar them. Such natural losses aside though, I am also sure that there are local pickers who head up there and sociably pluck their local heritage in its season, so I took only a few. The next day, on the road back from the village of Cardrona, where at least one Gold Rush building survives intact in the form of its famously quaint pub, elderberries (Sambucus nigra) joined the hamper. 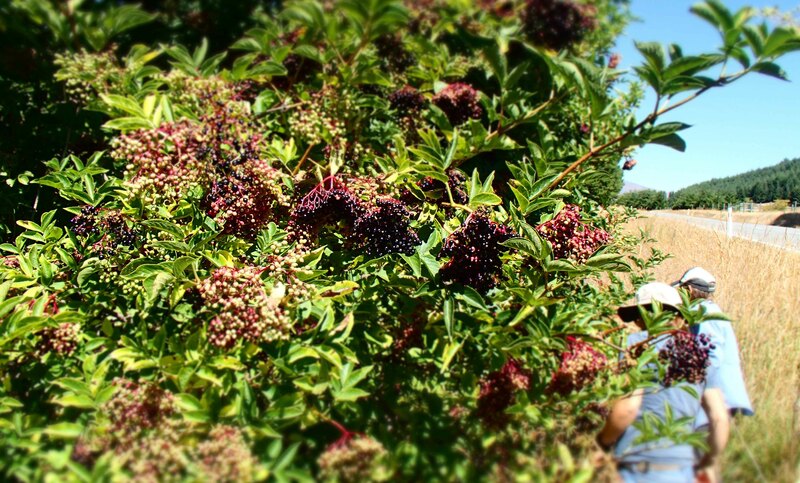 I always assumed that when I posted on elderberries that it would be about elderberry wine. But being on the road at the time, I was pretty sure that they would not let me on the plane with a batch of fermenting wine as carry-on luggage. And so they joined the Stewart Town pears and some local thyme honey in a jelly. Mixed together, the pears’ pectin-fuelled setting ability and fruitiness offset the elderberries’ depth and tannin-like edge. It was all simmered with a little water until soft enough to mash and strain through cloth and set in the fridge (with a little added pectin from a packet to be safe (which was only available as pectin-enriched ‘Jamsetta’ sugar)). Reducing it all down this way also had the added benefit of cutting down on the luggage weight of bringing it back to Australia. Where it now sits awaiting pancakes to lie upon with the ruby richness of a late summer Otago forage. The recipe used is more pear than elderberry and comes together pretty easily from posts and associated comments here and here.